Total time: Approximately 1 hour 15 minutes. In an oven-safe baking dish, evenly space dollops of butter. Place the sliced ginger root on top of the butter pieces. Layer the sliced onions on top of the ginger. Place pork chops to cover the piles of butter, ginger and onion. Sprinkle with salt and pepper. 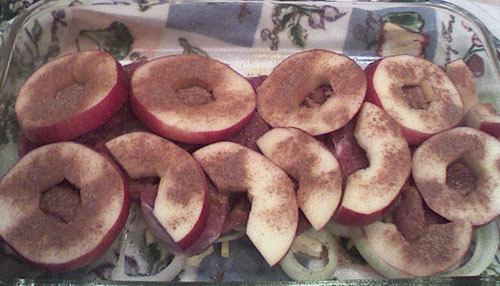 Lay apple slices on top of the pork chop piles. Sprinkle with cinnamon and sugar. Cover and bake 45-60 minutes (thicker chops may take up to 90 minutes). I was halfway through devouring my dinner when JB asked if I’d taken a picture. Of course not; I was unable to resist the aroma. 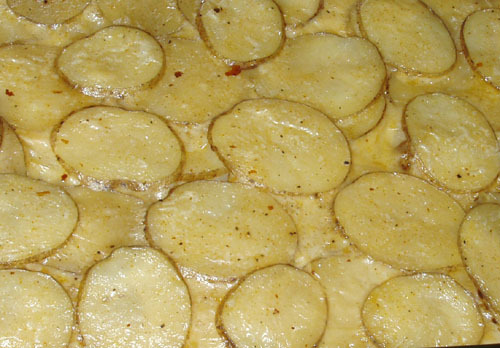 Adapted from Scalloped Potatoes and Onions at AllRecipes. Stop right here if you don’t own a mandoline. You may continue without a mandoline ONLY if you have patience to rival Kesuke Miyagi. 1. 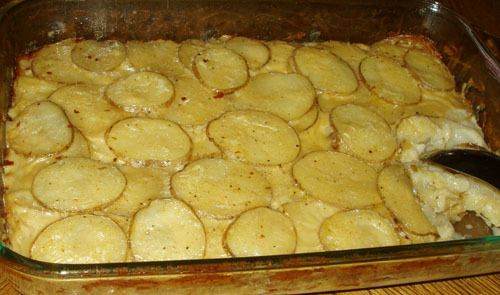 In a greased 9×13 baking dish, layer potatoes and onion. 2. In a saucepan, melt the butter; stir in flour until smooth. Gradually add broth, sour cream, salt and pepper; cook and stir for 2 minutes or until thick and bubbly. 3. Stir in milk and paprika. Pour over potatoes. 4. Cover and bake 90 minutes or until tender. I uncovered my dish at the 85 minute mark and ended up just keeping them in there until they browned. My guess is it was a total of 2 hours (120 minutes). I probably “overbaked”, but they were still really saucy and soft, with almost no crispness. The original recipe didn’t call for milk. I wasn’t going to use milk at all, but I just felt like I had way more potatoes than the original recipe called for, so I added a cup of milk to be on the safe side. If you’re using a smaller baking dish, don’t bother with the milk; the steam from having a covered dish produces plenty of moisture. Ready for grilling or dipping! * If you’re using fresh fruit, you’ll want to stew them first. We’ll use the leftover water from the stewing as the water and sugar. Bring 3/4 cup water and fruit to a boil, then cover and simmer over low heat for 30 minutes. Drain, but keep the water. Set aside fruit. Heat onions in 1 Tbsp of oil over medium heat until onions turn “clear”. Add lemon juice, vinegar, fruity water (or water and brown sugar), mustard, salt, all three peppers, and remaining vegetable oil. Bring to a boil, then simmer uncovered 20 minutes. Add fruit and Worcestershire sauce to the onion mixture. Bring to a boil and then remove from heat. Allow the mixture to cool some (about 10 minutes). Puree all of it. Refrigerate any unused portions up to 2 weeks. This makes just under 2 cups of barbecue sauce, enough for 5 large chicken breasts. Maybe you like the chunks of onions, maybe you don’t. I love onions, but I like my sauce to be smooth. This barbecue sauce is ready to eat once it’s finished boiling. The flavor *does* change once it’s cooked into the meat, but it’s only a very slight change. In a small dish or plastic bag, mix flour and seasonings. Coat beef cubes in flour mixture. In a skillet, cook beef and onion in oil until beef is browned and onion is tender. Add broth to the skillet. Bring to a boil. Reduce heat; cover and simmer for 45 minutes. Uncover; stir in any remaining vegetables. Cook until heated through. 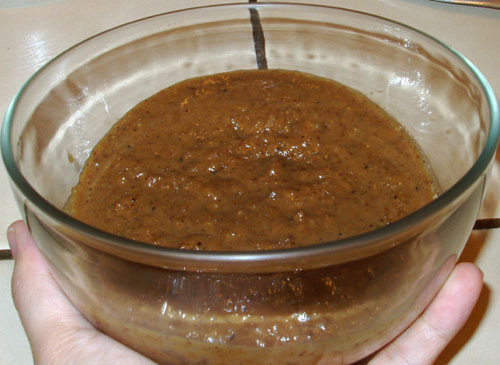 Spoon meat mixture into a greased 9-in. pie plate or 4-cup baking dish and cover with pastry dough. Be sure to make a slit in the top to release steam. OR — Spread half your pastry dough across a pie plate for the bottom crust, spoon mix on top, and cover with remaining dough (or cheese or mashed potatoes or breadcrumbs or crackers). Bake at 375 degrees F for 35-40 minutes or until pastry is lightly browned on edges. 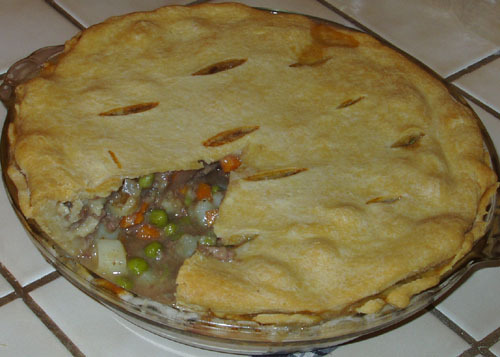 If you’re doing a bottom crust and a top crust (pot pie! ), increase bake time to 1 hour. Let cool 10-20 minutes before serving. * Today I’m using Durkee chicken seasonings. If you don’t already have a “mixed” seasoning, you could try salt (1 tsp), black pepper (1 tsp), paprika (1/2 tsp), garlic powder (1/2 tsp). Or make up your own; you just want a 1:3 ratio of seasoning to flour. Total time: 10 minutes, depending on your fruit. 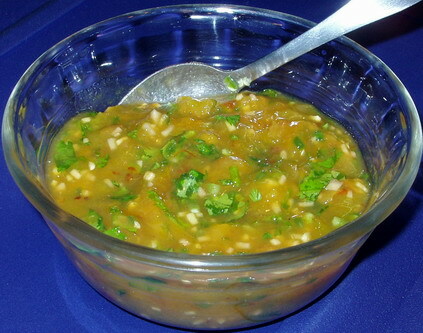 Adapted from “Pureed Fresh Mango-Ginger Chutney” in 1000 Indian Recipes, by Neelam Batra. Mash the plums with a fork or potato masher to make the fruit as smooth as possible. Keep up to 1 week in the refrigerator. Some of the Daring Cooks used a plum chutney with their September Challenge, which made me want to try it, too. Then a friend brought me some fresh plums from her tree, and I knew it was meant to happen. I didn’t use the same recipe as the other folks, though. I love my book of Indian recipes, and I like to make them adapt! The original recipe calls for mashed mango, and suggests mixing in 1/2 c yogurt or substituting peaches, plums, nectarines, pineapples or other soft fruit in place of mango. The Daring Cooks‘ September challenge comes from Indian Dosas from the reFresh cookbook by Ruth Tal and Fresh Restaurants. This filling works great as a rice bowl topping or as a wrap too, so don’t be afraid to make a full batch. Can substitute potatoes for chickpeas. 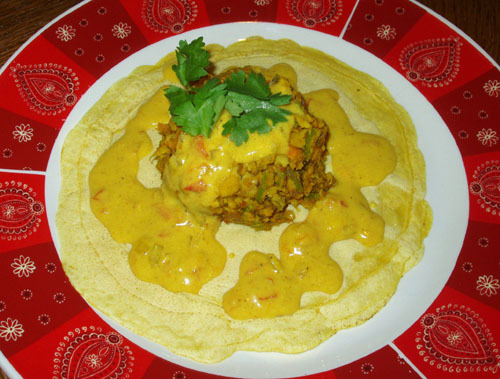 Shown here served inside Instant Flour Dosas, topped with Coconut Curry Sauce.